7 November 2014, at 5:36a.m. DENMARK - Synchronisation of gilts with Altresyn allowed more even numbers of matings every week, and this resulted in a more regular flow into the farrowing rooms, better utilisation of farrowing house capacity and more piglets weaned, according to CEVA research. The ability to introduce a proper number of replacement gilts is essential for batch management to maintain the batch size, regardless it is a weekly or more week batch management system, according to N. Thing of Krogsgård Svineproduktion in Denmark and co-authors from LVK and Ceva in Denmark and Ceva in France. Having gilts exhibited oestrus at a predicted time simplifies the entry of gilts into the sow group and allows using more efficiently the farrowing facilities. 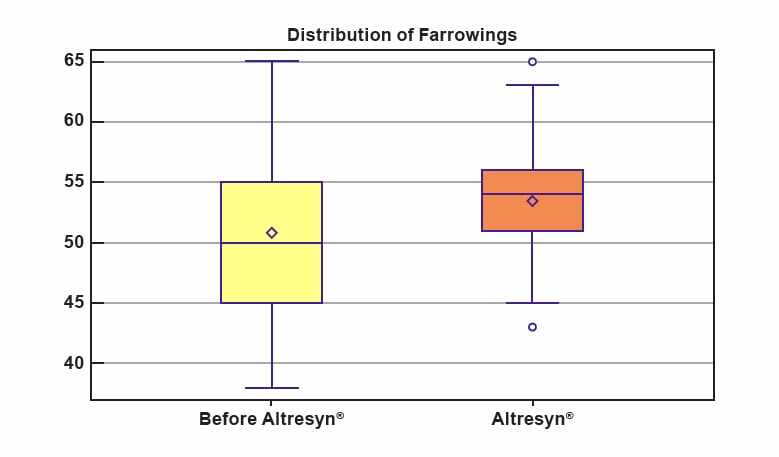 A SPF 1170 sow farm with weekly farrowing cycle started to practice the synchronisation of gilts using Altresyn® in October 2012. The reason was to avoid weeks with too many weaned piglets due to uneven availability of gilts in heat every week and to unify the age of gilts at first service. Gilts after observed first estrus were treated 18 days with Altresyn. Farrowings of 42 batches with synchronized gilts were compared with previous 40 batches, when gilts were inseminated in 2nd spontaneous heat. Student’s t-test and Bartlett’s test were used for the statistical analysis. Out of 816 gilts treated with Altresyn, 758 were successfully mated (93 per cent) with high rate of synchronisation (89.7 per cent mated within three days). When counted altogether sows and gilts, 94.5 per cent of them were mated in 3 days, compared to 83.5 per cent before. Planned timing of oestrus and mating optimised the age at first service (Figure 1.). The average number of weekly inseminated gilts increased from 13.2 to 15.3 (p<0.05) and the variability among weeks decreased significantly (p<0.0001). The statistically significant difference was also for homogeneity of variance before synchronisation and after in terms of weekly served sows and gilts together (p<0.005). As the result the weekly number of farrowings in batches with synchronised gilts increased from 50.8 to 53.5 (p<0.05) and became more even as well (p<0.05). Better filled farrowing rooms with less divergence resulted in the increase of 1.2 days of lactation and 27.5 piglets weaned weekly on average (p>0.05). The reproductive performance of P1 sows treated as gilts with Altresyn was similar as before with the conception rate 92.1 per cent and WOI 5.3 days compared to previous results of 91.4 per cent and 7.8 days. Synchronisation of a planned number of gilts in heat to be introduced into new batches was a challenge for the weekly operating farm. 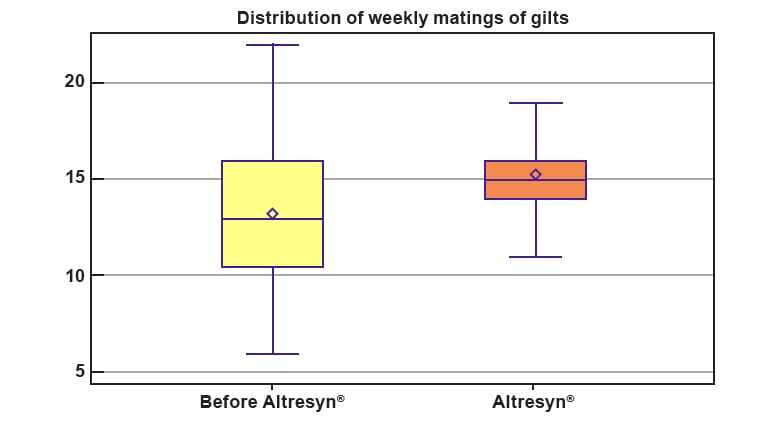 Synchronisation of gilts with Altresyn allowed more even numbers of matings every week. Higher homogeneity of the flow into the farrowing rooms improved the utilisation of farrowing units which resulted in higher overall weekly output of piglets.